What is an Arbor Used For? An arbor is a vertical structure in a landscape or garden that can provide shelter, privacy, shade, and serve as an accent. It can blend in with the landscape or separate different garden areas and direct traffic. Its walls and roof consist of open framework to support colorful and fragrant vines. An arbor can be attached to a fence, wall, or structure or be freestanding. 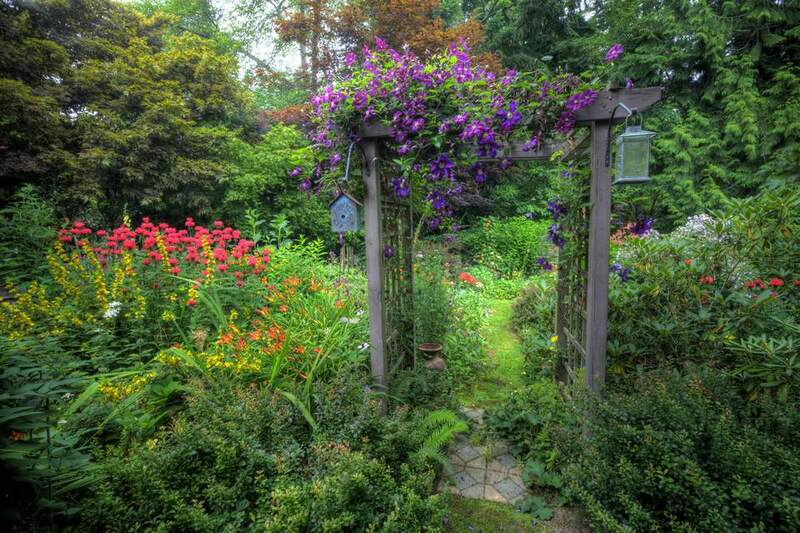 While similar, an arbor is a major structural element, while a trellis is smaller and more delicate. Arbors can be constructed from wood or wrought iron, and can be a do-it-yourself project or bought at a garden center or online. Arbors consist of two or four posts with a simple slatted roof (often arched, but not always). The sides of an arbor can be open or covered with lattice or trellis work for a more enclosed effect and to help vines better attach. When designing an arbor for your yard, consider repeating architectural details of your home. This will help tie together the house with the landscape. The standard height for an arbor is 8 to 10 feet, which allows plenty of room to walk under and maintain vines or plants climbing and growing overhead. Whether it will be freestanding or attached, an arbor will be supported by columns or posts, which support horizontal beams, rafters, or arches. Wooden rafters can be basic or detailed, with scrollwork and notches. In addition to vining plants, the arch or roof can be lattice, lath, or covered with a shade cloth. Arbors can be built with standard lumber—just make sure it is strong enough to support vines, some of which can become woody and heavy as they grow. They can also be bought and assembled in kits and come in materials like iron, bamboo, and other metals. Like an arbor, a pergola can be freestanding or connected to a house on at least one side. Often built over a patio or deck as a shade structure, pergolas are based on a similar post-and-beam construction as arbors. When attached to a house, a pergola will extend from the roof, creating a shaded space that connects the house and garden. A freestanding pergola can be identified by having four or more posts or columns. It supports a roof that is traditionally flat, with beams left alone in one direction or topped with cross beams or slats. An arbor also has an open roof, which can be flat or arched. Learn more about the similarities and differences between pergolas and arbors. What is a garden arch? Arbors and gazebos are both garden structures that provide shade from the sun and shelter during cool evenings. Both offer a place to sit, relax, and enjoy the garden, a view, or entertain. If planned and positioned well, these two structures can link a house to the landscape, help direct foot traffic, frame a great view, or hide an unsightly one. Gazebos and arbors can be built or are available in a variety of styles, from rustic to Victorian to modern. While a gazebo is constructed with open, airy framing, it has a feeling of being enclosed because of a solid roof overhead. It is also much larger than an arbor. Gazebos can be made more private by adding outdoor drapes or curtains on at least a couple of the open sides. Conversely, an arbor features more open framework on its walls and roof, and often has vines growing up its sides and overhead. How Do Pergolas Differ From Arbors?